There's something for everyone at CSL Grand Finals. Overwatch, Vainglory, Super Smash Bros, and Fornite will all have open tournaments for attendees to compete in. Here's some more details on each and how you can get on the action. This 8-team Overwatch open tourney will take place on Saturday April 28 from 2pm-10pm. This is a special invite and open tournament, with priority given to local area college teams. If you are interested in playing this event, please register your team on cstarleague.com and contact [email protected] to indicate your participation. Open slots may be available based on the response to this event, and in that case you will be able to register on site. This tournament will feature a $1000 prize pool, with $600 going to the winner, $300 to second, and $100 to third. That’s enough to enjoy an entire weekend at CSL Grand Finals! The first collegiate Fornite open event will be on Sunday April 29 from 2pm-7pm. Squads can enter to compete on site 2pm-7pm, registration is on-going before and during at the free play area, and is open to anyone with a student ID of any grade level with no same school team restrictions. There will be a tournament admin on site at all times to help track tournament wins and ensure the best experience possible. We will have Smash Bros action all weekend at CSL Grand Finals! Along with our divisional finals event taking place on site, we will have open Melee and Smash 4 tournaments. Melee singles will take place starting Saturday at 1pm, and Smash 4 singles will take place on Sunday starting at 2pm. 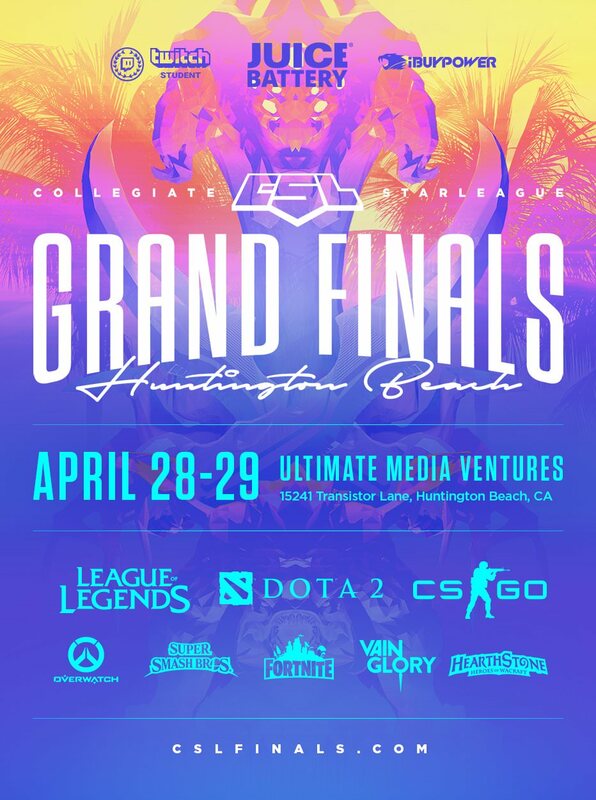 On Sunday night, we’ll be showcasing a Pickup & Pro Crews exhibition featuring four top players from Southern California--MSF Larry Lurr (Fox), CLG VoiD (Sheik), Charlie (Fox), and Zenyou (Mario) will each draft two college students for a single elimination bracket with $300 for the winning team. Come watch some of the best players in the world sync up with the top CSL season contenders! Sign up for #CSLFinals18's #SSBM & #Smash4 open singles bracket and Pick Up & Pro Crew Battle with @gsmVoiD, @LarryLurr, @_Charliedaking_, and @ZenyouX! Represent your school while competing for a $1,000 prize pool! In this eight team Bo3 tournament, all players on a team must come from the same school. Which school will be crowned Vainglory 5v5 champion? Compete in our $500 prize pool 5v5 open tournament! Players do not have to be from the same school. Sign up with your friends or meet other Vainglory players at CSL Grand Finals to team up with! Eight teams max. Sign up for either or both tournaments on this form to reserve your spot!